In 2018, the Youth Olympic Games will feature a breaking competition. And selection for this new competition, at least the early round, will be done through social media. A video posted to several breaking social media channels advises interested dancers that if they were born between January 2000 and December 2002, they should upload videos of themselves breaking to Facebook or Instagram and mark them with the hashtag #IAmBreakingForGold. 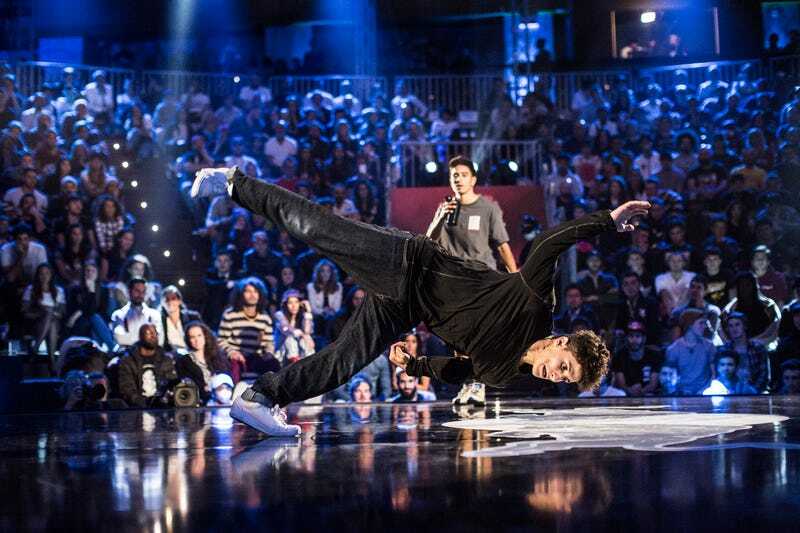 In some respects, the “open call” for young b-boys and b-girls reflects the ethos of the artform. The barriers for entry into a battle have historically been low: Show up, write your name on a list and wait to be called to compete. (Sometimes you might write down the name of someone else, who is running late but wants to battle.) The main obstacle was knowing about a party or battle, since news of an event typically spread through word of mouth. In other words, you had to be in the community, or at least adjacent to it, to participate. The internet has changed the way in which information about events is disseminated, just as it has changed most things, but the YOG’s “open call,” despite its usage of social media, feels like something of a throwback to a time when you could just show up and throw down. An “open call” such as the one that is ongoing does, though, feel like an unusual way for participants to qualify to a competition in the Olympic movement. Olympic sports tend to very hierarchical, with layers of rules and requirements. I highly doubt that the athletes in the other YOG disciplines will be uploading videos to Instagram or Facebook as their first step to Olympic gold. After this open round, however, things will become a bit more rigid. The videos that are uploaded will be judged by a panel of experts who will determine which five dancers per country (and per gender) will advance to the next round. Approximately 650 b-boys and b-girls will participate in the regional qualifiers: there’s one qualifier for the Americas, which will be held in Pennsylvania; another for Europe and Africa, which will take place in Germany; and one for Asia, which will be in Taiwan. This whole project is being administered by the World DanceSport Federation, which had previously been known as the international federation for ballroom dancers. In 1997, the IOC recognized the WDSF as the official governing body for “DanceSport,” which made it eligible to be included in the pantheon of Olympic sports. And it has spent the past 20 years trying to get in. Strife TV produced a video back in February about the debate that featured prominent b-boys talking about their misgivings about the WDSF’s attempt to shepherd breaking into the Olympics. In it, legendary b-boy Crazy Legs of the Rock Steady Crew spoke about how this whole process has been shrouded in secrecy. “We don’t actually know who is calling the shots. People who have put years and decades into the game were not even approached,” he said. Clearly, Crazy Legs meant that he hadn’t been approached despite being one of the most famous b-boys in the world. It seems that WDSF has managed to quiet the opposition by bringing them into the process; Crazy Legs now has top billing as a judge. (There are many other well-known, at least to the community, names on the list of judges.) Storm, another breaking great, posted to Facebook a few days ago that the judging system for the YOG is almost finalized. He stressed that the judging shouldn’t have any influence on how the dance is done. “The judging system is created, so the judges know what to look at and how to look at the dance, how to process the info and give those thoughts transparency,” he wrote. It’ll be a while before we can determine whether or not the breaking scoring system will work so in the meantime let’s watch kids trying to make the Olympic dreams they’ve only had since December come true.